Find Magic Castle Hotel deals, discounts and special offers. This “magical” hotel is located just below the Magic Castle and close to the star-studded Hollywood Boulevard. Featuring full-service Spa Luce and 632 elegantly appointed rooms and suites, Loews features an outdoor pool. This trendy Hollywood landmark offers 300 guest rooms, 2 restaurants, pool-side bar, and central Hollywood location. This hotel has 63 suites and bungalows (some with full kitchens and formal dining areas) and offers luxury services. 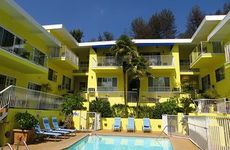 This Hollywood hotel is within walking distance of major attractions such as the Chinese and Kodak Theaters. Opening January 28, 2010, this hotel features a steam room, sauna and a restaurant & bar. The hotel is convenient to all the Hollywood attractions, such as the Hollywood Walk of Fame, and Capitol Records.